YOUNGSTOWN, Ohio —Workers’ rights headed to the top of Ohio’s gubernatorial race as Democratic Lieutenant Governor Candidate Betty Sutton called out Republican gubernatorial nominee Mike DeWine’s stance on so-called “right to work” legislation. During a May 29 press conference announcing an endorsement, DeWine did not speak out against reports that some Republicans have openly discussed trying to push “right to work” as a ballot initiative in 2019. Sutton added that believes DeWine should go on record telling voters he’s against it. Further, if DeWine is elected governor and the state legislature passes a “right to work” bill, Sutton wants DeWine to indicate now that he would veto it. 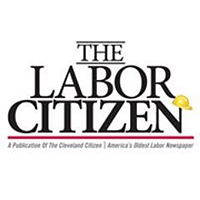 Earlier this year, State Rep. John Becker, R-Cincinnati, proposed six amendments to Ohio’s Constitution that, if approved, would have repealed prevailing wage laws, made Ohio a “right to work” state, prohibited state and local governments from withholding union dues, banned project labor agreements and required public unions to conduct annual recertification votes. Those measures mimic the rest of the right-wing agenda in other Great Lakes states. 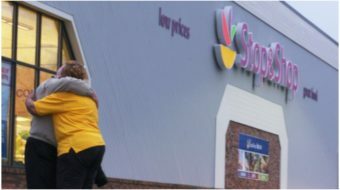 Cumulatively, all those moves – also all part of the national right-wing corporate agenda – would cut workers’ pay, weaken workers’ protections on the job, leave unions scrambling for income and members and lower living standards, studies show. While the past legislation against prevailing wage and for so-called “right to work” has stalled in state legislative committees, Becker is now trying to go directly to voters. Unlike DeWine, Cordray and Sutton have both publicly stated their opposition to any so-called “right to work” efforts. So-called “right to work” laws make it optional for workers protected by a union contract to help pay for the expenses that a union incurs while defending the rights of all employees. They restrict freedom of association by prohibiting workers and employers from agreeing to contracts that include fair share fees, forcing dues-paying union members to subsidize services to non-union employees. Current state law makes non-union members pay “fair share” fees for union representation at the bargaining table. If Ohio enacts a so-called “right to work” law, unions would take a major financial hit, as non-union – but union-represented workers – could take union services on and off the bargaining table without paying one red cent for them. Ohio currently borders four “right to work” states — Michigan, Indiana, Kentucky and West Virginia — which keeps unions in the Buckeye State on constant lookout for the next attack on organized labor. In the same Vindicator interview, Sutton pointed out Republican governors in Michigan and Wisconsin gave statements similar to DeWine’s and then later signed so-called “right-to-work” initiatives into law. 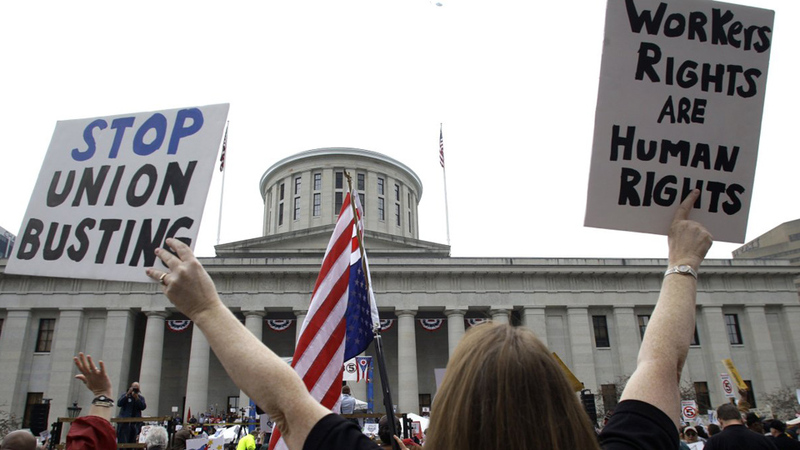 Having helped defeat Senate Bill 5 in 2011, when Ohioans overwhelmingly voted to overturn a law that would have drastically reduced the collective bargaining power of public workers, Ohio’s unions have worked to keep the public aware of other attacks on organized labor. The Cordray/Sutton ticket has received the endorsement of multiple building and construction trades councils and many affiliated local unions and district councils. Cordray and Sutton aren’t the only RTW foes speaking up. The Alliance of Construction Trades of Ohio, in its quarterly report to building trades union members, told them four cities – Brunswick, Middleburg Heights, Berea and Brookpark – adopted resolutions denouncing RTW and other right-wing anti-worker constitutional amendments. “I found it necessary I must stand up for working-class families,” Brunswick City Councilman Brian Ousley explained. “Everyone wants to make this a partisan issue, and it is not,” added Ousley, a member of Laborers Local 310 in Cleveland.